A good way to identify sharks is to use a guide where you will find most of the species and subspecies with their official names and appearances. I like these 'taxonomies' because they give you an idea of the complexity of our evolution, and the wonderful variety of species. But they can also be tedious, because you will have to go through the whole scale of class, order, family, genus and species. And the features needed to identify a specific shark such as its teeth are not always obvious. To keep things simple I here focus on the colour of the tip of the fins of some common sharks. So we have white tipped sharks and black tipped sharks. Although these sharks are all members of the family of Requiem sharks or Carcharhinidae, some may still belong to a different genus, that is a different subcategory of the family. Here we go. 1.Oceanic white tip (C. longimanus) rounded dorsal fin at its apex, broad and long pectoral fins, found offshore and along steep drop offs. A bold shark that often closes in to or bump divers. 2. Silver tip shark (C. albimarginatus) conspicuous white-silvery ending on its fins. Found along the deeper edges of the coral reefs. See picture above. 3.White tip reef shark (Trianodon obesus), rat like face. Nasal flaps. Often in shallow water. Slender body, allowing the shark to wriggle itself through tunnels or crevices in the reef wall , when its hunting smaller fishes at night. 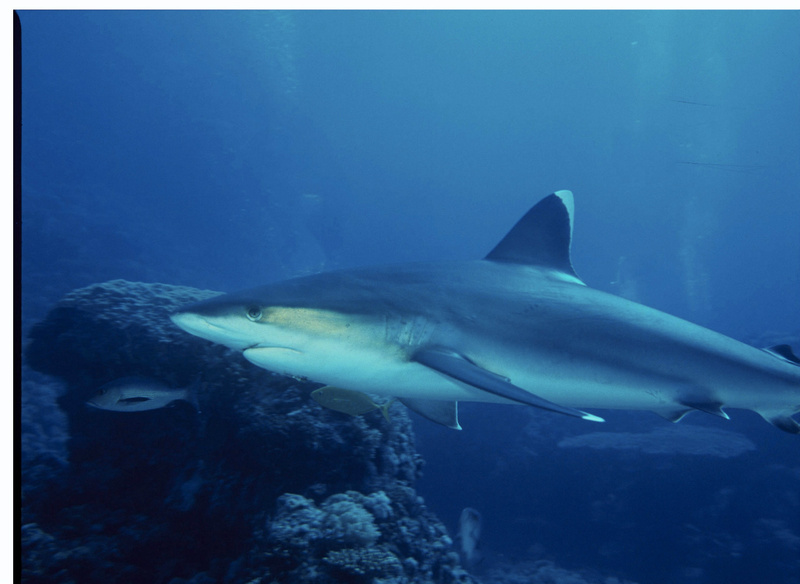 The whitetip reef shark swims with strong undulations of its body, and unlike other requiem sharks can lie motionless on the bottom, often with a pack of other white tips, and pump water over its gills for respiration. A shark that is often found at the same location on a reef. 2.Black tip reef shark (C. melanopterus) prominent black tips on all fins, often in shallow areas and remaining within the same local area for up to several years. 3.Grey reef shark (C. amblyrhynchos), very common shark of the Indo-Pacifi c reefs. Prominent black edge to tail. Dutch ichthyologist Pieter Bleeker first described the grey reef shark in 1856 as Carcharias (Prionodon) amblyrhynchos. An older name of this species is C. menisorrah. The Paficic variety is more agressive than the Red Sea/Indian ocean variety. A stiff swimming pattern with pectoral fins down might forebode a swift attack on an intruder in their territory. Jeremy Stafford-Deitsch. (1987). Shark. A photographers story. (Appendix) Headline publ. London.